Well known for its abundance of scenic space, forest wilderness and waterfront greenery, Portland also boasts a few extinct volcanoes on its outskirts and anyone looking to enjoy life outdoors will find numerous chances to do just that. 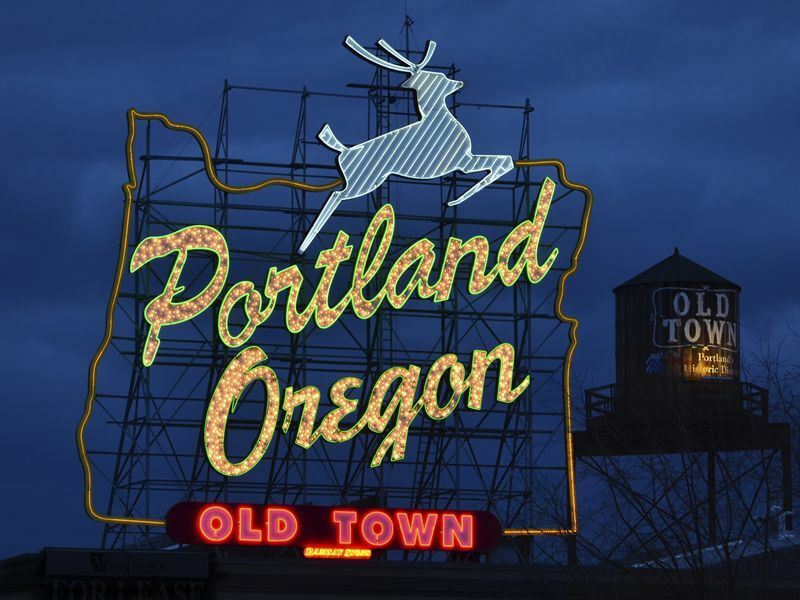 Although often regarded as a haven for retirees, Portland also has a pretty cool music scene with the Decemberists, Blitzen Trapper and the Shins all hailing from, what has been coined, 'America's Karaoke Capital' - thanks to the untold numbers of sing-a-long bars that have opened up. So, if you're into your green scene or you just happen to be passing along the Pacific Northwest coastline, check out our top 10 things to do in Portland that will keep you happy and active until the day is done. This is one of the coolest commutes that you're ever likely to face however, if you haven't got to go to work and you just fancy taking in the Portland views from over 3,000ft then jump on-board and enjoy the ride. This is 3 minutes of fun that will take you from the South Waterfront to the top of Marquam Hill providing some great bird's eye photos as the city streets turn to fir-covered hillsides. This is the oldest west coast museum of its kind and a 'must visit' for anyone interested in Native American art and art history. With more than 40,000 pieces on display it's no surprise that this is one of the largest art collections in the country and a really peaceful place to explore, especially on a rainy Portland Sunday afternoon. Aside from the American exhibits there's also a permanent Asian art display as well as a blend of modernism and contemporary ranging from Monet and van Gogh to Jules Olitski and Anthony Caro. Note: the museum isn't open on Mondays – boo! However, it is open until 8pm on Thursdays and Fridays – yay! The adventure park on Mt Hood does exactly what it says on the tin and if you're looking to reverse bungee, take on a 32ft climbing wall or make the most of more than 40 miles of mountain biking downhills then welcome to paradise. During the winter the park changes to snow-covered heaven and with the largest night skiing area in the whole of the USA, it would be rude not to check out at least one of more than 30 fully-lit runs. If you're stuck for something to read whilst visiting Portland then pay a trip to the awesome Powell's indie bookstore that pretty much has every copy of everything ever printed housed within four-storeys of paper and hardback heaven. As the largest book store of its kind anywhere in the world you'll find over 1 million volumes within almost 60,000sq feet of space and even if you're just looking to hang-out and sup coffee, this is pretty much the place to be. This state park ranges for almost 650 acres and promises a rich variety of wildlife as well as numerous walking and biking trails, some of which offer wheel-chair access and come complete with water fountains. If you fancy taking things at a slightly faster pace then you'll be pleased to hear that there's a 3 mile cycle trail which will take you all the way to Lake Oswego. Named after the Governor Tom McCall and promising over 35 acres of riverside natural beauty, the park on the west bank of the River Willamette is pretty much where the locals come to do lunch and have fun. If you're in the mood then you'll find a whole host of energetic ways of enjoying the park with plenty of space for jogging, biking and skating without getting any hassle. This is also a popular haunt for festival goers and from fans of the blues to the annual roses parade, it's no wonder that this is one of the most popular spots on the Portland map. Portland is blessed with more micro-breweries than any other city on the planet and if you're doubting the city's love of beer then check out the annual Oregon Brewer's Festival which is where things start to get serious. With local brew pubs coming with names, such as: the Lucky Labrador, Bridgeport Alehouse and the Green Dragon, you'll find the brew as authentic as the locals and as McMenamins also holds a cinema there's definitely more than one way to enjoy a drink in Portland. Basically, there's some form of salmon that you're going to be in with a chance of catching throughout the year and just dipping your bait into the Columbia River is pretty much an experience in itself even if you come back empty handed. Best advice is to go on an organised tour where your guide knows the best spots and can give you some handy pearls of wisdom depending on the time of year and your level of experience. Covering a phenomenal 400 acres, Washington Park is made up of a series of gardens and wooded hills that provide the perfect spot for untold amounts of outdoor activities. Whatever you're into: football, archery, tennis or animals, Washington's got the lot and with Oregon's largest zoo housed within its boundaries, this is a winner all day long. As the Columbia River Gorge stretches for upwards of 80 miles, you'll find loads of trails and lookout points that are perfect for day trekkers and lovers of nature photography. Gorge trekking is one of the Portland locals all-time favourite pastimes and from river rapids to tumbling waterfalls, it's well-worth putting in the effort.